It is absolutely remarkable to me, the lessons that I learn in private. (then post in this most public of situations, irony intact). We are here in San Francisco for a quiet get away. Unlike most people, we came here for the fog and the cool weather. The person who owns the house where we are staying enthusiastically reported yesterday that we were fortunate to have some of the best weather and sun in months. I felt bad as I did it (to late to catch myself) telling her that coming from Santa Barbara, we were hoping for a bit of fog and such. There is something very comforting when the weather actually changes or is not 78 and sunny. I suppose it is sort of like having a spouse that abuses you and feeling uneasy when that person is not there to "keep it real". 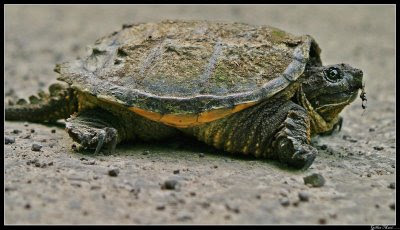 Not a great analogy, but it occurs to me as a component of how the psyche can deal with such a situation. So last night, the fog came rolling in and most of the evening Christine and I watched in amazement from out perch on the top of a hill as the city was enveloped. Most dramatic and fulfilling was the street lamp directly outside of our window. Being that this is a very steep hill and that we are slightly elevated (although we are living below the people who own the house, which is fabulously reminiscent of Beacon Hill) the street lamp is even with our window. So for the last hour or so I have been watching the fog swirl around the light and then dissipate. I sat down and made some notes about the piece that I am working on with the intention of capturing the fog on film before to long. Then just after I set the camera, line up the shot and make certain all is in place I notice that the street lamp has just gone out (in the moment that I focused on the camera). It is of course disappointing and humorous, especially as the other street lamps are still on and it is only this one that is not. As I reflect on this event it occurs to me that there was a level of thought involved in this set up and also that there was an expectation that this state of being would continue. Of course, I was soon reminded by the automatic timer in the lamp that this is indeed not the case. The lesson I draw from this is the immediacy that one must apply to artistic work. This bit of footage that I hoped to capture had the potential to be entirely graceful and beautiful (I spent hours watching it after all). Having the awareness of my self, to recognize hours ago that this was worth shooting would have resulted in lots of time to work out a great shot. Now, I am left with a notion of something to keep an eye out for in the hopes that it will reoccur and that I can be ready at that time. Of course this is a very valid and useful situation as well. I often find myself reflecting on the connection between the observations that I make while spending time intimately engaged with nature and artwork that I make far removed from that situation. None the less, I can't help but notice an opportunity missed that will certainly never present itself exactly as it already has, only in a similar fashion. I am reminded of the flow of energy that surges through me as I know I am riding a wave of creative gesture. Here I sit, bobbing in the proverbial ocean reflecting on the wave that has just gone by and recognizing that I could have had a great ride had I given over to the flow and caught that wave. I will be in NYC next week for 2 concerts. 1. 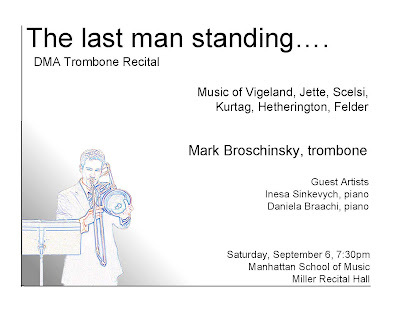 Sept 6, 7:30 @ Miller Recital Hall(Manhattan School of Music) :: Mark Broschinsky will perform Christopher's susone for trombone and electronics. NOTE: This is not at Columbia's Miller Hall, it is at Manhattan School of Music. 2. 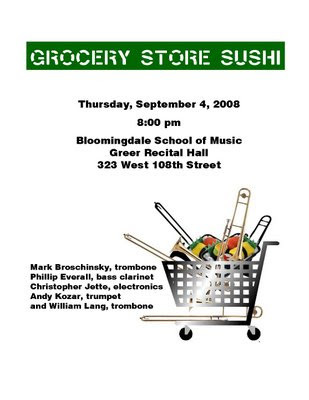 Sept 4, 8pm @ Bloomingdale School of Music NOT Roy Aria as earlier reported :: A live improv set on laptop (with various acoustic instruments) as a member of Grocery Store Sushi. Those are all dates that occur in two thousand and eight, the year of our lord. This has some fabulous assimilation undertones and is really a special American view of the idea of art and "the power of the arts". It has been an intense 2 weeks of work. Here is a sound portrait of Orford Canada.